SNAP!!! Geocaching: The Hidey Awards!!! Do you like finding really neat and interesting caches??? to your face when you find it!!! "Thank You" to the COs of those caches!!! Then here is your chance!!! What exactly are these awards??? most interesting Geocaching Hides in the Hampton Roads area. (N 36° 50.847 W 076° 17.348). 2. Must be an active cache, not archived. Exception: Cache of the Year + one other category. since you must find the cache before voting for it. and labeled as a Small, Regular, or Large on geocaching.com. as a Micro or Not Chosen/Other on geocaching.com. Eligible caches must be listed as Puzzle/Mystery on geocaching.com. These can be online or field puzzles, mysteries, or challenge caches. Eligible caches must be listed as a Multi-Cache on geocaching.com. Letterbox Hybrid, or Earthcache on geocaching.com. Caches should have a Historical aspect. All physical geocache types are eligible. Caches can be a Hike, Paddle, or Scenic View. All physical cache types, Virtuals and Earthcaches are eligible. Caches must be a part of a Series or Geo-Art. Caches should have a creative container. "best of the best" from the Hampton Roads area. (must be active and placed prior to 2016). types, Virtuals and Earthcaches are eligible. Here is the Timeline for all events surrounding the awards! on Saturday 6 January 2018!!! So hurry up and get those nominations in.. They are due by midnight on October 15th!!! 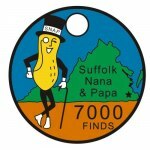 Labels: #gogeocaching, #SNAPgeocaching, Geocache, Geocaching, Geocaching blog, Geocaching Hampton Roads, SNAP, SNAP!! !